Tanzania’s second tallest mountain, standing at 4,562 metres (14,967 feet) provides a challenging climb as a prelude to Kilimanjaro or stand-alone adventure. 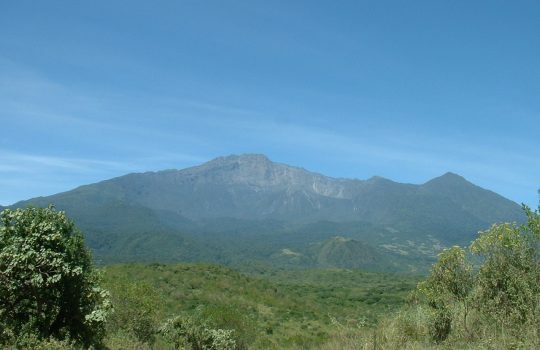 Mt Meru is a dormant volcano – inside Arusha National Park -allowing opportunities to see wildlife on the way and lush natural forests. The terrain of the hike can be steep in places and passes through a variety of wilderness teeming with bird life, volcanic lava ash and a rocky summit. The climb itself is not to be underestimated; the summit attempt starts in the early hours of the morning, walking in darkness for a sunrise summit. The peak can be reached in three nights, four days but is a challenge. For a more relaxed and successful expedition we recommend the five day itinerary that allows for a night before and after at our private mountain camp, Itikoni Camp. The advantage of starting and finishing at Itikoni Camp is the wonderful opportunity to walk through untouched, uninhabited forest rather than taking the main tourist road. Our group’s hike with our guide and the Park Ranger only while the porters and support staff (as well as all of the other tourists) take the main pathway giving African Environments clients a totally exclusive experience. During the expedition – night two and three – you will sleep in park provided huts allowing the expedition to be a little lighter than when on Kilimanjaro. The huts are equiped with bunk style beds with mattresses and pillows provided. We don’t have to bring tents for the clients and crew, shared kitchen and mess buildings are also provided. For our expeditions we provide an experienced Wilderness First Responder trained guide, wonderful cooks and all the fresh and varied food to get you to the top. African Environments loves hiking in Arusha National Park – it is just so absolutely stunning! – so much that we have all of our Kilimanjaro itineraries also begin within the park, at our camp to better aid acclimatization. If you are limited for time, but are keen to do some hiking in Tanzania as well as a photographic safari Mt Meru is a great option. Arrive into Arusha and spend two nights acclimatizing at Itikoni Camp in Arusha National Park, this will be where you start your Meru climb. Day 1 Leave Arusha and drive to Itikoni Camp our luxury acclimatization camp at 6000 ft in Arusha NP for the night. This is a stunning spot to prepare for the climb and grow accustomed to the altitude, and of course sundowners looking out at Kilimanjaro! Day 2 The following day hike across and join the trail to Miriyakamba hut for the night at an altitude of 8500 ft. From here we can go on an evening game walk in hopes of watching some wildlife at one of the watering holes in the crater. Day 3 A steep hike up a well-groomed trail with a seemingly endless series of steps. The route roughly follows the rim of the crater, there are some tremendous vistas through the trees. The hut lies at an altitude of 11,500 ft. in the saddle between Meru and Little Meru. If time allows, we can climb Little Meru for a good view of Kilimanjaro and a bit more acclimatization. Day 4 Up early and on the way to the summit before dawn, the aim is to get a good part of the route done before first light. The aim being to get to top early enough to enjoy the views before the clouds come rolling in later in the morning. The climb itself is dramatic with the ground dropping away precipitously on both sides as the route ascends the crater rim. The vegetation is left behind within an hour of leaving the hut – all that remains is the stark lava landscape. From the summit, we should be back to the 11,500 ft. Saddle Hut in time for a late lunch. After lunch, we will hike down past Mariakamba Hut to Itikoni Camp for a night relaxing with hot showers, cold beers and great food.